I have said it before to all my Oregon Winemaker friends, I realize you had to clear your warehouses of 2011 product however, it was not a “DIFFERENT” Vintage than 2012. It just plain SUCKED!!! Even now, Wine Spectator is calling the 2012 vintage SUPERB, AMAZING, THE VINTAGE OF THE DECADE!! I may not go that far however as a restaurant Sommelier and personal lover of Oregon Pinots, I taste a lot of wine from many different producers. I haven’t tasted one bad 2012. Some are slightly better quality than others but Stevie Wonder could have produced a fantastic Pinot Noir in Oregon in 2012. As I mentioned, I taste a lot of wines for my job but also drink a lot of Oregon Pinot Noir at home. Finally, I wanted to pass along, THE GAME IS OVER. You can stop searching and I can stop tasting. Nothing can possibly compete with the 2012 Pinot Noir I tasted two days ago. I love Rollin Soles and his wife Corby pictured above. 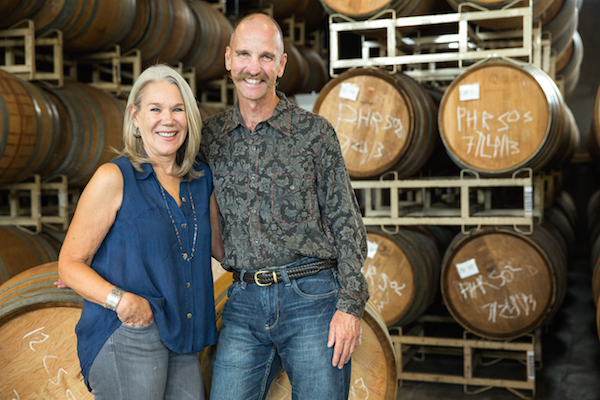 Rollin learned his winemaking craft in Switzerland, Austria, Washington State before settling in at Argyle Winery in Willamette Valley, Oregon in 1986. Of course at Argyle, from his award winning Pinot Noirs to his Amazing Bubbly and Roses, I have always been a huge fan. Then Rollin And Corby formed their own little venture combining the first two letters of their first names, to form ROCO Winery All the wines are amazing but one in particular I have never tried because it isn’t easy to find unless you work as a Restaurant Sommelier like me. Every vintage Rollin And Corby or ROCO grabs some fruit from the Chehalem Mountains that he doesn’t make a lot of but is his Own PRIVATE STASH Hence the name ROCO PRIVATE STASH PINOT NOIR he numbers this project each vintage which started in 2002 so the Private Stash I tasted the other day was NO 10 and yes from the famous 2012 Vintage. Those of you who know me, know that I am an Oregon Pinotphile. In fact I very rarely drink Pinot Noir from anywhere else besides Burgundy France if I can afford it. This wine was not just the best of the 2012’s I have tasted but maybe in my 25 years of only drinking Oregon Pinot even in the Crappy 2011 Vintage lol, this is the game changer. I don’t ever need to try another 2012 Pinot again. This is literally the best Pinot Noir that has ever touched my palate. Floral, Ripe, Plush Red Fruits, hints of Mocha, Vanilla Spice, and these floral aromas and finish to the wine that coats your palate like Ben And Jerry’s Ice Cream!!. I think Harvey Steinman from Wine Spectator who covers that Oregon Beat went way under on his 93 Scoring on this one. I would literally give this a 97 point rating and I am telling you folks that this is the Best Pinot Noir you will ever put in your mouth. You might need to smoke a cigarette after finishing the bottle because I know I am divorced but I had an Intimate moment with that glass of wine that I think I might have been Violated!! The bad news is the price tag isn’t cheap and it is very difficult to find if you are not in the Restaurant Industry. It should run about $65 Retail if you can locate it from the Winery or Internet Sources. On a Restaurant Wine List you can expect about $180-$195 and it is worth every penny considering a bottle of CRU BURGUNDY of this type of quality would run you over $1200. I am glad Rollin And Corby decided to share some of their PRIVATE STASH with the public. I think that is quite generous and if it were me,I probably would just hold it back form my family and friends. As for me, the search for the best of the 2012 Vintage Oregon Pinot Is Over… WE HAVE A WINNER LADIES AND GENTLEMEN. ALL BETS OFF. 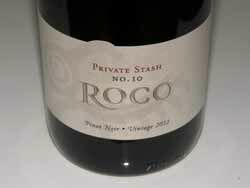 2012 Roco Private Stash No 10 Willamette Valley Pinot Noir is worth cutting back on Groceries for the Week to try. Next75% That’s All Your So Called Cabernet or Merlot is? Choose Wine By Taste!